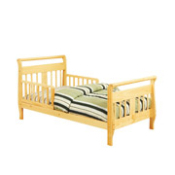 With its low to the floor height, our rental toddler bed is just right for a youngster making the transition from a crib to a standard height bed. Two side rails for added security. Includes a standard crib mattress and 1 sheet. For ages 3 and up. Styles and colors may vary.